Quan Ho performances on the Nguy​en Phi ​Y Lan Lake in B​ac Ninh City every Saturday aim to promote the art form within and outside the northern province. Bac Ninh (VNA) – Dozens of Quan ho (love duets) artists in the northern province of Bac Ninh – the cradle of the traditional art form – are coming together every Saturday night to entertain audiences in a very special performance. Instead of performing in the yard of a communal house, which is the typical venue, the singers perform on boats on the Nguyen Phi Y Lan Lake in Bac Ninh city. The boat performances are among activities aiming to preserve values of the traditional art form that was recognised by UNESCO as an intangible cultural heritage of humanity in 2009. Tran Quang Nam, Director of the province’s Culture, Sports and Tourism Department, said Quan ho has different sub-genres, including hat chuc, hat mung (literally means greeting singing); hat tho (ritual singing); hat canh – a kind of singing competition between a village’s Quan họ group with another group from another village, which takes place at night during every spring festival; and hat hoi or festival singing. 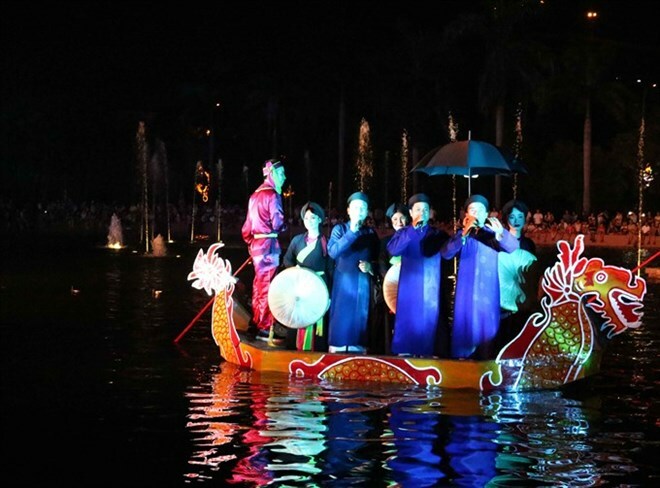 “In hat hoi, the singers perform on a boat,” he said, explaining why the Quan ho boat performance has been a significant part of any traditional festival in Bac Ninh province for centuries. “We expect that the Quan ho boat performance every Saturday night will be a meaningful cultural activity, helping introduce and further promote the unique art form to residents within and outside the province,” Nam said. The one-hour performance on Saturday night gathers artists and singers from the Bac Ninh Quan Ho Theatre and the Bac Ninh Provincial College of Culture and Art. Even those who do not know this art form will find it easy to enjoy the performance because “the singers always say something about the song they are about to perform”. Nguyen Xuan Trung, Deputy Director of the culture department, said that despite Quan ho having hundreds of songs and tunes, it is not easy to create an interesting and different repertoire for every Saturday performance. “From among an abundant list of hundreds of songs and tunes, we have selected carefully about 60 songs which are suitable for performing on the boat,” he said. Quan ho is an art form that combines various elements, including music, lyrics and costumes, and features the distinctive culture of people in the region, formerly called Kinh Bac.